The Belize Barrier Reef is a series of coral reefs straddling the coast of Belize, roughly 300 meters (980 ft) offshore in the north and 40 kilometers (25 mi) in the south within the country limits. 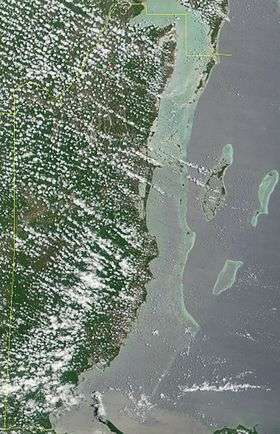 The Belize Barrier Reef is a 300-kilometer (190 mi) long section of the 900-kilometer (560 mi) Mesoamerican Barrier Reef System, which is continuous from Cancún on the north-eastern tip of the Yucatán Peninsula through the Riviera Maya and up to Honduras, making it the second largest coral reef system in the world after the Great Barrier Reef in Australia. It is Belize's top tourist destination, popular for scuba diving and snorkeling and attracting almost half of its 260,000 visitors. It is also vital to the country's fishing industry. 1 2 Harrabin, Roger. (2006-06-12) Reef at forefront of CO2 battle . BBC News. Retrieved on 2011-10-21. 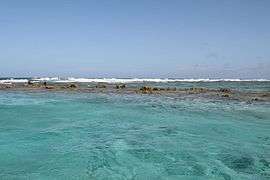 ↑ "Scuba Diving in Belize: The Blue Hole, Ambergris and Turneffe Atoll". dive-the-world.com. ↑ Belize Barrier Reef Case Study. Westminster.edu. Retrieved on 2011-10-21. ↑ "Guatemalans trawling in Belize’s southern waters". Channel 5 Belize. 27 February 2013. Retrieved on 2013-02-28. 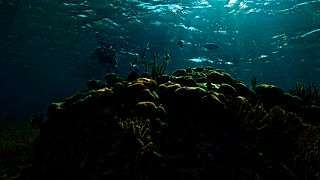 ↑ "Belize Bans Bottom Trawling in Exclusive Economic Zone". Oceana.org.8 December 2010. Retrieved on 2013-02-28. ↑ "Government Implements Ban On Offshore Drilling". 7 News Belize. Retrieved 23 December 2015. 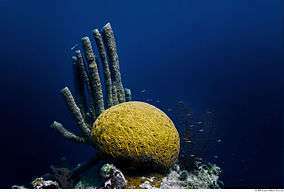 ↑ "Coral Collapse in Caribbean". BBC News. May 4, 2000. Retrieved on October 21, 2011.